Hollah.... WhatsApp can be hacked easily. Stealing someone's WhatsApp account sounds completely impossible, still hackers have attempted to do so. By a number of methods such as spoofing device's Mac address, spy software or using QR code for the web it is possible. If you think your loving one is doing something wrong or nervous while chatting over the phone, you can surely take this step. As WhatsApp is used by millions of users worldwide, at the worst side of technology, someone may try to threat your loving one over texts. Spoofing Mac address works most of the time as it is a simple string of 12 digit number for every android device and can be copied easily. The workaround is to match victim's Mac address with your device allowing WhatsApp server to send mirror files. [Victim - Someone who's WhatsApp to be hacked. No android rooted device required. Mac address (Media Access Control) is a 12 digit unique characters which are assigned to specific hardware such as Wi-Fi device or network adapter, smartphone modem etc. If you get victim's device in your hands, you can copy it easily. Follow as per your device make. Android - Settings > About phone > Status > WI-Fi MAC address. Windows phone - Settings > About > More info > MAC address. BlackBerry - Options > Device > Device and Status info > WLAN MAC. Root your Android device, Click here - How to Root Android Device? Download 'Busy Box' apk and install as you do with other Apps. Download 'Terminal Emulator' apk and install as usual. Type $su and hit Enter. Again type $busybox iplink show eth0 and hit Enter. This will display Mac address. Replace, X with victim's Android Mac address. This way you will change new device's Mac address. To check again check Mac address use this command. Go to Play Store and Install WhatsApp Messenger again. This time, use victim's phone number for WhatsApp. WhatsApp will send a confirmation message to victim's phone. (Make sure you do this while you have a little access to victim's device). Copy the code instantly from victim's device and delete the message. Use this number to verify your WhatsApp account. With this, all messages and conversations will be updated to your device as well. Do not send or delete the message as a victim will know about the spy. Stay anonymous and keep watching. There is another easy workaround available which uses Spy software and app to be installed on victim's device. There are numbers of spy software available in android market. Download InoSpy App. It will track everything including cal history, recordings, WhatsApp messages, text messages and impossible to detect. Create a free InoSpy account here. Install InoSpy App on victim's Android smartphone quickly. Go online, log in to InoSpy account > Easily fill the info > Get access to victim's device. There are other spy softwares available such as mSpy, Spymaster Pro, BOSSSPY etc. Whatsdog is yet another app available in the android market to track someone's WhatsApp conversation. Airdroid is slightly difficult and impossible option as it required to be installed on victim's device as well as on computer on which it is to be mirrored. 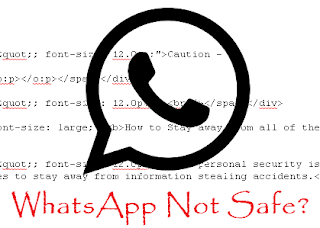 Using root terminals to read WhatsApp messages, WhatsApp Sniffer works well. Download here. It reads over an open wi-fi network, WEP, WPA/WPA2 networks. It is a TCPDump program which scans the network data packets and filters information from WhatsApp server. The worst part is it fully complies with WhatsApp’s legal terms. Well, its a monkey job to have his brother's phone in hand and to copy its content to his PC. It is that easy. Use QR code and do not forget to check 'Keep me logged in' option. Some kinda home spy. Caution - It is illegal to hack someone's device. You will be held responsible for stealing someone's personal information. How to Stay away from all these? Well, personal security has an utmost importance in the digital world. Follow these thumb rules to stay away from information stealing and accidents. It is often said by banks not to reveal any pin, passwords over emails or phones, similarly avoid texting them over WhatsApp messages. Avoid WhatsApp for sharing Bank level information. Avoid accessing your device in public wi-fi or over unsecured networks. Use SSL at public wi-fi if required. Strictly avoid people touching your device for any reason. This may include relatives, friends or even office colleagues. People curiously try to see your phone for design, model etc. purpose. Slap them with the make and model number instead. Most of the time conversations are of no use (unless done with a girlfriend or wife). So try to clear your conversations - Give no room for hackers. Log out of WhatsApp Web when done all the time.